Cabina Black Hills para su próxima escapada! ¡Explore el bosque nacional de Black Hills por la puerta principal de esta cabaña! Ubicada en Circle K Horse Camp en Custer, Dakota del Sur, Cabin # 202 ofrece la privacidad y las comodidades que desea para sus vacaciones. Estamos ubicados a 7 millas al oeste del centro de Custer y a solo 6 millas de Jewel Cave. Las atracciones de la zona incluyen Hell Canyon, Jewel Cave, Wind Cave, Custer State Park, el monte. Rushmore, Cosmos Mystery Area, Crazy Horse monument, Sturgis, Deadwood, Spearfish Canyon, Reptile Gardens y más. ¡Manténgase cerca de la acción sin la molestia de campamentos u hoteles abarrotados! Esta cabaña viene completamente amueblada con dos camas queen y un sofá cama tamaño queen, una gran sala grande con cocina y un baño completo. Disfrute de su café desde el porche delantero o prepare hamburguesas en la parrilla de carbón junto a la terraza. Por favor, no mascotas y no fumar. Absolutely loved, the view, tranquility. Enjoyed the spacious kitchen, living room and dining, even the bathroom was spacious. The only downfall was parking the bikes, the gravel needed to be leveled out. And an area for parking the car. All in all our stay was fantastic, would definitely stay again and have already maentioned it to others. Thanks Circle K cabins for making our stay memorable. A trip my son will never forget. This property was clean and comfortable. We enjoyed our visits from Shiver's the cat. I would suggest ceiling fans in the bedrooms. Also, the front door latch stuck so door was difficult to actually lock. Info to others: There was no hair dryer, no body soap and no internet. 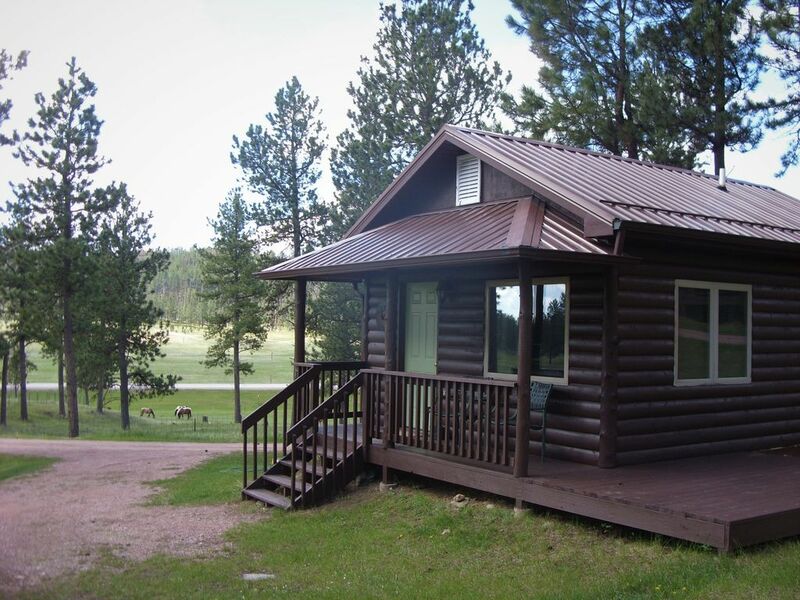 The property is beautiful, the owners are friendly and the cabin was clean and spacious. We really enjoyed our stay. No mosquitoes, no bugs in the Black Hills. The property was so quiet and we enjoyed sitting on the deck every evening. The cabin provided a private grill and there was also a private fire pit. Our kids had fires every night. We liked seeing the buffalo on the property and my kids especially enjoyed the little kitty that visited us every day. The beds could be a little more comfy and the couch was a little rough and other than that the place was perfect. We would definitely come back to this property again! Perfect for our large family! Thank you for your review! And you were right, that sleeper was looking a little rough. We replaced it with a new sleeper today, so it's all ready for your next visit! Thank you for staying with us; we're glad you enjoyed your cabin stay and Black Hills vacation. The location of the cabin was excellent. We were close to Custer and other activities in which we wanted to participate, but were far enough out of town that we were secluded from the city. However, the cabins themselves were mediocre. When we originally booked the cabins, the list of amenities included WiFi, among others. The week before our stay, the amenities listed online changed and WiFi was removed from the list. Upon arrival, we found out that the cabins did not have WiFi. The inconvenience of finding a location with WiFi was detrimental, as three in our group of five needed WiFi for work purposes. Neither AT&T or US Cellular had cell phone service at the cabin and there was no landline. The cabin itself was fine for what we needed, as we didn't spend any more time there than the time necessary to shower and sleep. Upon arrival, the owners only gave us one washcloth and five towels for five of us. We had to request more washcloths, but once requested, the owners promptly gave us what we needed. On the first night, we noticed that the smoke alarms in the cabin were in the kitchen drawers. When we asked the owners to re-install them the next day, they said they took them down to paint and would re-install them "sometime." There was also no fire extinguisher in the cabin. Without cell phone service or WiFi, a smoke alarm, or a fire extinguisher, we did not have the ability to extinguish a fire or contact the fire department (or anyone else) for help. The smoke alarms were still in the kitchen cabinet when we left. The knob to turn on the water in the shower was broken, but would eventually catch and turn the water on. The cabin floor was free of debris, but I would not consider the cabin clean. The white shower tub had black marks all over it, the kitchen table had dried food on it, and the stove in the kitchen was heavily stained with old food. The sheets on the beds were clean, but the mattresses were dirty. In addition, the beds had an extremely thick layer of dust and dirt under them, including an old, dirty pillowcase. The bathroom did not come with any hand soap, so we had to purchase our own. The owners were very nice and accommodating, however, we had to request everything we needed. They did not seem to anticipate any of our needs. Overall, I would not recommend this cabin. We were very uncomfortable with the way they handled our request to re-install the smoke alarms and hope they installed them before the next renters. I would like to take a moment to respond and clarify a few things in your review. First, the cabin has never been advertised as having wi-fi, so I'm sorry you were confused. Cell service and wi-fi are sketchy in this area of the hills, and I would never advertise any of our units with wi-fi. If you thought the property was advertised with wi-fi and then had that feature removed a week before your arrival, I'm not sure why you didn't contact us then to clear up any confusion. While you had pointed out the smoke alarms were down, there was no request for us to immediately reinstall them, nor did you ever mention anything about the cabin being "filthy". So we didn't disturb your vacation, we waited and reinstalled them when you left; obviously a small oversight after a full property face lift. There are fire extinguishers in every unit, under the kitchen sink. What concerns us is, while you were here we asked repeatedly about your stay and if everything was okay, and you repeatedly said yes, it was great. I wish you would have brought these issues to our attention for an immediate solution instead of waiting a month after your stay to complain online. We are a small family operation and this is our first full year in business; things are bound to get missed. While we're disappointed you waited to voice your concerns, we appreciate you taking time to provide feedback so we learn what we're doing right and what we need to improve.